Sundered (game, 2017). A metroidvania video game by Thunder Lotus Games. Developed by Thunder Lotus Games. Official Trailer. 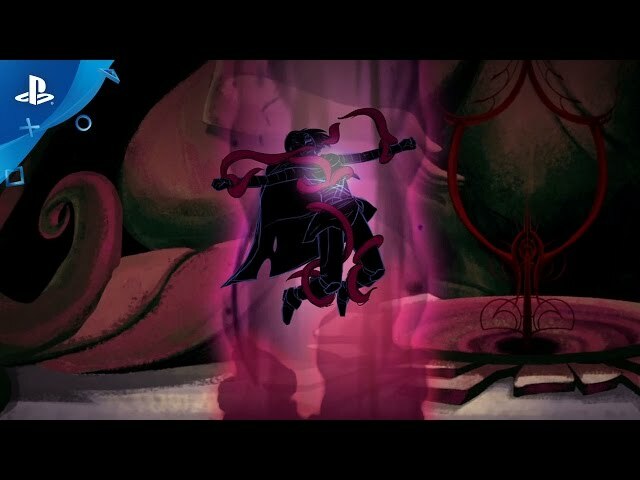 Sundered is a metroidvania video game by Thunder Lotus Games, developed by Thunder Lotus Games. 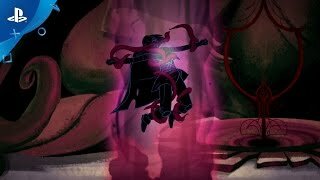 Sundered - Embrace Trailer | PS4. The game makes heavy use of Lovecraftian horror elements. The game opens with a woman, Eshe, wandering a desert in a sandstorm when, coming across mysterious ruins, she is pulled into the ground by a mysterious force. Falling into an ever-shifting underworld, Eshe encounters the Shining Trapezohedron, which grants her the power to defend herself. The two begin to travel the caves together. As they progress, the Trapezohedron explains that their civilization, an Eldritch theocracy known as the Eschaton, was at war with an invading force known as the Valkyries, who used advanced technology to fight their eldritch magic. The final confrontation between the leaders of these two groups during a summoning ritual caused the ritual to fail, resulting in the remaining Eschaton to become monsters, the remaining Valkyries to become corrupted and fused to their war machines, and the landscape to become warped and unstable. Eshe fights through the monsters and the machines, acquiring Valkyrie technology to help her attack enemies and navigate the underworld. As she does, she finds Elder Shards, fragments of the failed summoning ritual and vessels of eldritch energy. The Trapezohedron urges Eshe to allow it to use the Elder Shards to permanently "Corrupt" her abilities, making them more powerful but at the cost of her humanity. Alternatively, Eshe can use a Valkyrie incinerator to destroy the Elder Shards for bonuses to her base stats. The game has three endings depending on what the player chooses to do with the collected Elder Shards. Sundered is a metroidvania game, where the player must traverse a side-scrolling world and unlock new abilities to progress. These are unlocked at shrines, and the player can also open shortcuts that provide a faster way across the game's world. The game makes use of some random elements, as enemy hordes will spawn randomly and try to attack the player. Additionally, after every death, the passages connecting the game's areas rearrange themselves using procedural generation. Sundered was scheduled to be released by Thunder Lotus Games on July 28, 2017. This video game is available for the following platforms: Windows, Mac OS X, Linux, PlayStation 4.